We talked to Michael Minardi about his big win, the first such decision in a jury trial in the state's history. Last week, a Florida pro-pot lawyer named Michael Minardi successfully argued that a man arrested on charges of growing weed needed the drug for medicinal purposes. It's the first such decision in a Florida jury trial—ever. Following an anonymous tip in 2013, Broward County Sheriff's Deputies found and confiscated 46 plants and arrested Jesse Teplicki, a 50-year-old suffering from chronic anorexia. He passionately testified in court that he needed the weed to be a productive member of society. The case sets a precedent for future trials and also highlights Florida's inch-by-inch slog toward acceptance of weed. Last November, 58 percent of Floridians voted to permit medical marijuana in Florida, narrowly falling short of the required 60 percent threshold. In the Florida legislature, a bill is snaking its way through the Senate that would allow doctors to use cannabis to treat patients with illnesses such as ALS, AIDS, Parkinson's disease, and Crohn's disease. Minardi, a passionate and battle-tested attorney, is on the front lines of this fight. He's used the medicinal necessity defense successfully before, but never in front of a jury of Floridians. I caught up with him on the phone as he made his way to court on Friday. VICE: It looks like you just won the first medical necessity defense ever by a jury. Tell me a little about the case. Michael Minardi: Mr. Teplicki suffers from severe chronic anorexia, a condition he's had since he was nine years old. He was underweight and malnourished as a child. In four years of high school, he only gained ten pounds. He discovered cannabis at 17. He gained 13 pounds in the first six weeks of use. He had a desire to eat (for the first time) and actually started to enjoy eating. He was able to control his anxiety and his illness—that's how it started for him. What happens when he doesn't have his medicine? Over the years, he'd been without cannabis on numerous different occasions and suffered. He even ended up in the hospital, where they were unable to find a diagnosis (for his symptoms), or do anything for him. We had the medical records for one stint—between 2004 and 2005. He had to take a drug test to get clearance to do marine mechanic work, so he stopped using for a month. During that time, he lost 20 pounds. He went in the hospital and lost 15 more pounds. They discharged him with no diagnosis. Have any doctors figured out what's going on with him? Well, when he was a child he was told by an endocrinologist that there was a misconnection between the brain and his body. The signal from the brain regarding eating, desire to eat, and things like that was not being transmitted correctly to the rest of his body. How was that fact used in the case? What we know today, and what Dr. Denis Petro, who was our doctor, testified to, was that now we know the pharmacology of the endocannabinoid system. That system regulates a lot of the vegetative functions of the body. Research shows that receptors in our brain control appetite, control nausea, and regulate our system. That's why chemo patients [who use marijuana] want to eat, because the cannabis activates that part of the brain. Did your client ever tried any other medications? He's tried over 16 medications. Nothing worked for him. One caused loss of motor control in his arms. That won't work. This is a man that wakes up nauseous every morning and won't eat. Cannabis is the only thing that's worked for him. Tell me about the trial. It took us two days to get a jury. 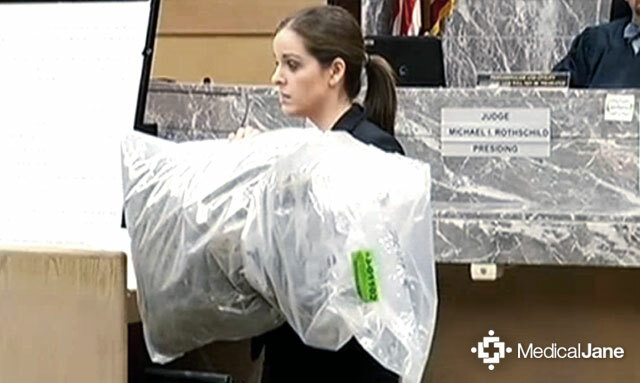 The state threw around a big bag of cannabis, they had all 46 plants in one bag. The state's doctor, from my experience, was uneducated on the endocannabinoid system. The state said Teplicki hadn't been to enough doctors and he hadn't tried everything before choosing cannabis. While Mr. Teplicki was testifying, he really hit it home when he explained the effect his illness had on him, and why he felt he had to use to be a productive member of society. And he is: His daughter just graduated from medical school. One of his sons is in college and the other is on the way to law school. He wanted to show that these are the people he lived for each and every day. Was there a moment where you felt things were turning your way? I like to think as a confident and competent attorney I always feel like I'm going to win. I'm a competitive person, but I was cautiously optimistic. During his testimony, the way he answered a question about how he felt and why he was fighting, it was so powerful that I just had to stop. There was a part of me that thought, I don't know how any jury could look at this and say, "I'm going to punish a hard working man who isn't a criminal." He's just using this to survive. The jury recognized it was a disease he's had since he was a young child, and they had compassion for the fact that he's been suffering his whole life. Who are we to say he hasn't? How did you get into marijuana-based law? It's something I actually had knowledge of and wrote about in law school. I joined an organization called NORML (National Organization for the Reform of Marijuana Laws). Growing up I read High Times and they exposed a lot of the hypocrisy of the government and the lies about cannabis. I had numerous friends in high school affected by drunk driving. My mom passed away in 2003 from lung cancer. When I was young, I knew I wanted to be an attorney. I'm Italian—I used to argue with everybody. I've always had a distaste for authority, I think. And seeing what this is doing to our society, people being locked up and their lives lost from cannabis, it's just ridiculous to me. It's a plant. Do you have any advice for people out there? Everyone should know their rights. Go to Florida Cannabis Action Network. People should be educated and prepared. Knowledge is power and knowing what you can do and being confident is important. Remember, cops can lie and they can tell you anything they want to get into your house, your pockets, or vehicles. Get active. Get vocal. Contact your legislators. Let's get relief for the sick and suffering people of Florida. Follow Jon Silman on Twitter.